As you near the end of the harvest, consider letting a few fruits and flowerheads go to seed. Collecting seeds from plants is one of the oldest activities humans have engaged in since they transitioned from a nomadic lifestyle to a more sedentary one. Even though we now have access to seed catalogs and nursery stock, collecting seeds is a time-honored activity that any gardener can and should participate in. Ancient Egyptians, Native Americans, and European settlers all harvested seeds for future crops and to grow wild plants for cultivation. 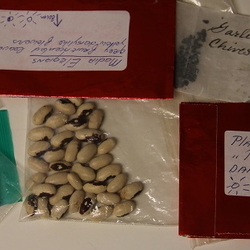 These people planned for the future and, in some cases, might have been forced to flee from their home country: taking seeds with them was an easy way to ensure food resources. For most gardeners, the seeds collected will mainly come from flowers, herbs, and the occasional heirloom vegetable variety. Keeping species separate is pretty easy when it comes to vegetables, but it can start to get a little confusing if you're harvesting wildflower seeds. In either case, the easy fix is to try and separate certain species but not to worry about combining others. If you're trying to grow or share seeds that are guaranteed to yield a particular species, then by all means keep their plants separate. If, on the other hand, you’re not concerned about mixing columbines with monkeyflowers, allow them to mix away. When you're starting out, try to harvest the seeds from healthy plants that exhibit good growth and vigor. This will help maintain a good genetic stock. You’ll also want to harvest seeds from plants after their fruits have ripened, rather than at the time when you would normally harvest fruit for eating. In The Complete Guide to Saving Seeds, authors Robert and Cheryl Moore-Gough describe this distinction as “horticultural ripeness” versus “physiological ripeness.” Harvesting fruits too early will result in underdeveloped embryos. Conversely, don’t wait so long that the fruits are attacked by disease, animals, rot, or are lost to dispersal. 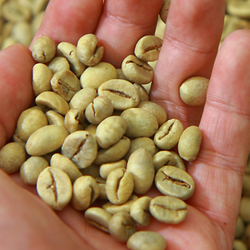 Focus on physiological ripeness to get the best possible seeds. Separating peas from a pod or shaking out dark penstemon seeds from a capsule should prove easy enough. If the pods have already ripened, they might even split open on their own. The tricky part comes when dealing with fleshy fruits like cucumber, in which the seeds are embedded inside and require a more extensive drying period. Harvest the seeds from seed pods and flowerheads and give them a final chance to dry out. There may be unexpected moisture on them, and moisture is not a gardener’s friend. Place the seeds on newspaper or a fine screen to let the air circulate around them and help them dry. Seeds from pumpkins, cucumbers, and other fleshy fruits will require a little more preparation, time, and need to be cleaned off before being left to dry. 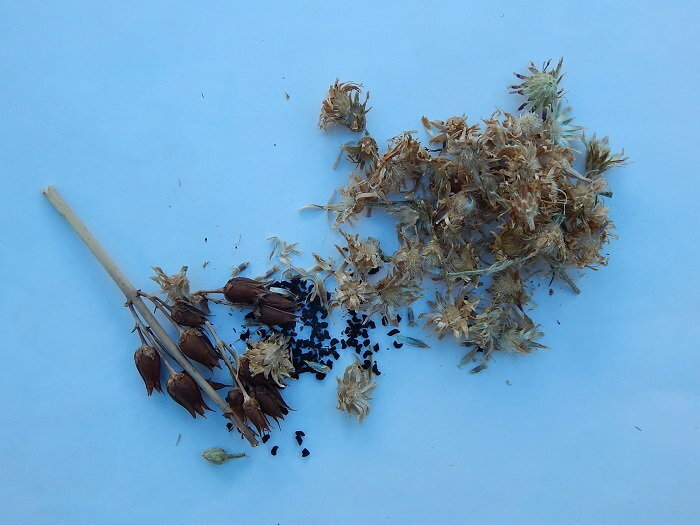 Herb seeds are easy to harvest, but it's a good idea to keep the smaller seeds separate from the rest. Otherwise, it might be hard to tell the herbs apart. Dill is pretty easy to I.D. and stores well, as does basil. The lifespan of a seed will vary depending upon its species. During an archaeological excavation in the Southwest, researchers found sealed clay pots from the Anasazi civilization that contained bean seeds. Though they were over 1,000 years old, some of the seeds still managed to germinate. While a 1,000-year lifespan is certainly impressive, a general rule of thumb is that most seeds will last anywhere from 3 to 10 years, depending on how they're stored. Seeds with thick coats tend to last longer, and germination rates tend to decline over time as the seeds start to break down. 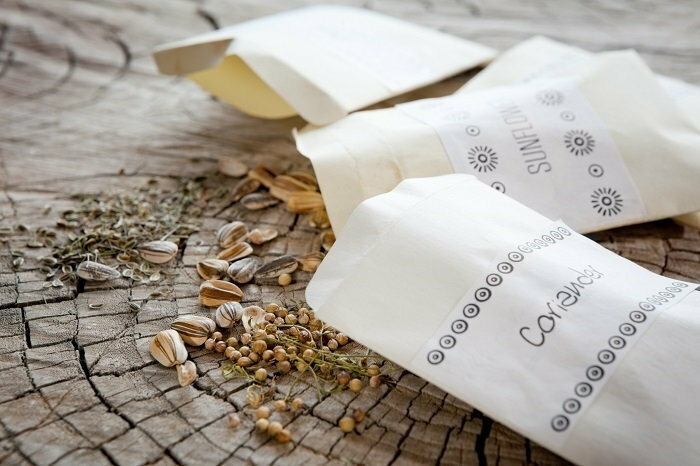 Humidity and temperature are difficult for many gardeners to control, so store your seeds in the paper or glassine envelopes you'd find at an art-supply store in a cool, dark place for optimal results. You can place a small number of seeds in each envelope and store them in a box for convenience (it's much easier stacking up a bunch of small glass jars). If you opt for plastic sandwich bags, remember to leave a portion of each bag unsealed to allow gases to escape. If your seeds need to be cold-stratified in the freezer later on, put them in small freezer bags along with a paper towel insert. Again, humidity and light are two factors that are guaranteed to reduce your seeds' lifespans and chances of successful germination. Take care to protect them, and maybe think like one of the ancient gardeners: survival might hinge on the longevity of these seeds. 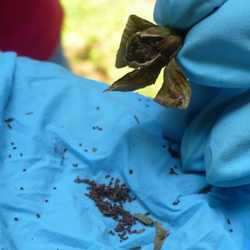 The wildflowers that grow in your garden or in the surrounding wildlands produce some of the easiest seeds to collect. Many annual and perennial flowers are allowed to go to seed, offering an abundance of harvesting opportunities. Gardeners that deadhead their spent flowers risk missing out on this potential seed source, but it’s easy enough to let some of the blooms mature if you're looking to start saving. Even if your goal is to create a wildflower mix, try your best to keep these plants separated by species. That way, you'll be able to grow some individualized varieties with specific needs. If you happen to live in an area where there's a seed swap, be sure to take advantage of it. The reasons are many: cost of seeds, socializing, “local first," and maintaining heirloom varieties or known plants that thrive under local conditions. Maybe you belong to an organization that relies on seed submissions from members, or you just can’t keep your hands off the plants as you walk through the woods. Whatever the reason may be, check with your local library, extension office, or gardening group to see if they're offering a seed swap. It’s a great way to plant ideas and harvest the experiences of other gardeners. Damian is contributing writer to Dave's Garden. 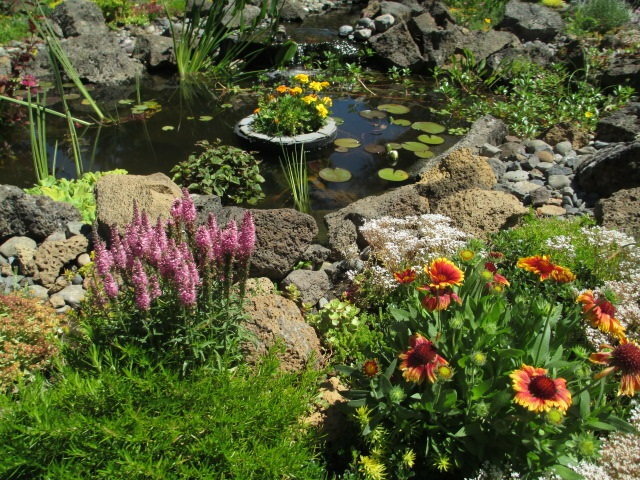 He is a freelance writer, hiking guide, gardener and wreath-maker living in Central Oregon. He has published several books including Pacific Northwest Wildflowers and Canyon Country Wildflowers with Globe Pequot Press.